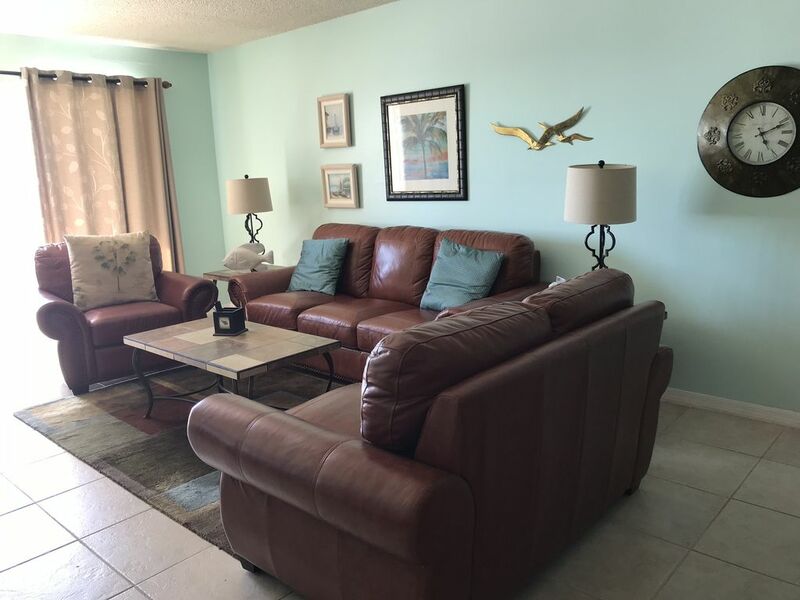 completely tiled floors, two bedrooms/ master bedroom has 2 queen sized beds and second bedroom has 1 queen size bed, flat screen TV's in each bedroom, new tile and glass bathrooms, just remodeled, fully equipped kitchen, dining room and balcony over-looking the Gulf of Mexico. There are a large Jacuzzi® and pool downstairs. BR B Amenities: /B BR Jacuzzi and pool, air-conditioning,2 telephones, answering machine, 2 TV's , VCR, DVD Player, coffee maker, microwave, dishwasher, refrigerator w/ ice-maker, washer and dryer are located on the same floor, grill, shuffle board and bocce ball. Linens and towels are furnished. Umbrella/ cabana rental located on beach in front of condo. Ten minute walk to world famous John's Pass Village, restaurants, parasailing, jet ski, deep sea fishing, Casino Cruises, etc. Non-smoking please and no pets allowed. BR B Activities: /B BR Some area activities available are biking, hiking, golf, tennis, racquetball, miniature golf, fishing, horseback riding, museums, live theatre, swimming, snorkeling, diving, sailing, waterskiing, windsurfing, jet skiing and shelling. BR B Area: /B BR We are only 45 minutes from Busch Gardens and 90 minutes from Disney and the Orlando area theme parks. International Mall is only 30 minutes away as is Tampa International Airport. I was born in Tampa, so I have always lived close to our beautiful beaches. My occupation was an elementary school teacher, I am now retired and enjoy travel, but always happy to come home. We always rented at the Sea Breeze, so buying a condo there was an easy decision. The proximity to John"s Pass, ample parking and beautiful beach made this purchase a no-brainer. I fell in love with the ample space the condo afforded us, and the location close to public transportation and the view. Sit on the balcony while drinking your coffee and watch dolphins swim by. In the evening sit and watch the spectacular setting of the sun. Located on same floor next to elevators. Large comfortable leather couch, loveseat and chair. 55" Smart TV living room Flat screens in both bedrooms. We had a great stay. Condo was clean, nice, and convenient to everywhere we wanted to go. The issues we did have were resolved in a timely manner and Carolyn was very gracious about it. I would recommend this condo, it had everything as described. Carolyn was also very easy to work with. We travelled with friends and family and had a total of four condos rented. Ours was definitely the nicest! Thanks Carolyn! Thank you for your great review, I strived to keep the condo up to date and nicely furnished. Hope you decide to return next year. The property was great. Clean, large space, nicely decorated. Great view! Great location! Everything went well. Condo was clean and stocked well with the appropriate items you would need. Nice furniture. The location was excellent. Walking distance to John’s Pass shops and restaurants. The host was helpful, as the toilet was broken and someone was there to fix it within 2 hours. No complaints for my stay. I would recommend this property to anyone. Lynn, thank you so much for the great review, and for taking the time to write it. I try to meet all our guest needs,and if there is a problem to resolve it as quickly as possible. Overall, the condo was beautiful. Found the set up of beds a little confusing. A king bed in the master bedroom would be nice, rather than 2 doubles. The beds were 2 queens in master sleeps 4 and one queen in second bedroom which sleeps 2. This is done to maximize number of people. If I put a king in master, the condo would only sleep 3. I’m am truly sorry for the cleaning mix up, my housekeeper apologized profusely. The cleaning fee will be returned. I hope the rest of your vacation was very enjoyable. Overall, property was clean, well-maintained, quiet and right on the beach. Our unit was clean, nicely furnished, comfortable, and perfect for my group. Had a wonderful experience and would recommend as a nice family place for vacation! We loved our stay at Sea Breeze Condos!! We spent a lot of time at the beach and in the pool. The hot tub was great too. We saw dolphins from our balcony. We rode the waves. We walked to John's Pass. Thank you for such a lovely place to stay. We enjoyed our family vacation very much! Right on Gulf, two blocks north of John's Pass, fishing, jet skiing, shopping, dining, miniature golf bicycle riding, bus transportation up and down beach, near grocery stores. Minimum one week rental from Saturday to Saturday no exceptions. Rates include 13% State and Tourist Tax $110. 00 Housekeeping Fee A $300 Security Deposit is Required Rent is due one month before your arrival date after you book I will send you a rental packet in the mail, included parking pass, directions and codes..